"And there shall be signs in the sun, and in the moon, and in the stars; and upon the earth distress of nations, with perplexity; the sea and the waves roaring; Men's hearts failing them for fear, and for looking after those things which are coming on the earth: for the powers of heaven shall be shaken." Note the last sentence, "ON" the earth. Certainly we aren't far from those days. -W.E. WASHINGTON – The U.S. is becoming increasingly aware and concerned about the possibility within a few years of an electromagnetic pulse attack from an enemy's high-altitude nuclear explosion. The impact would include the loss of critical U.S. electrical infrastructure that could send the nation back into an 18th century agrarian economy, according to a report from Joseph Farah's G2 Bulletin. But experts have warned that such an attack could produce conditions more difficult than the 18th century due to the considerable increase in population and the total reliance by society on electricity and technology for life-sustaining factors, such as food production and delivery. Also hit would be transportation, medical and emergency services, telecommunications, and the economic and financial system. Republican presidential candidate and former Speaker of the U.S. House of Representatives Newt Gingrich, in a nationally televised presidential debate, recently declared that the potential for an EMP attack is perhaps the most serious national security threat facing the United States today. However, there is another threat looming that is not only possible but actually forecast, and it could fry electronics and knock out the transformers in the national electric grid system. It is an expected solar storm – or what's called a solar maximum – that the U.S. National Aeronautics and Space Administration and the National Academy of Sciences have confirmed to G2Bulletin could occur sometime between 2012 and 2014. The concern is that the nation is ill-prepared for such an event, given the impact that the pulse from such a maximum solar flare could produce with several hundred sunspots occurring on any given day, lasting for up to a month or so. The solar maximum storms occur once every 11 years on a regular cycle. Until now, the sun has been in what is termed a solar minimum. The storms occur when strong magnetic fields emerge through the solar surface and allow the area to cool slightly, from 6,000 degrees Celsius down to about 4,200 degrees Celsius. While the explosive heat from a solar flare doesn't make it to Earth, there is electromagnetic radiation and energetic particles that do. The solar flares temporarily alter the upper atmosphere, creating disruptions with signal transmissions from GPS satellites. The sun also produces what Karen Fox of NASA's Goddard Space Flight Center describes as something even more disruptive, known as a coronal mass ejection, or CME. CMEs are solar explosions that propel bursts of particles and electromagnetic fluctuations into the Earth's atmosphere. The electromagnetic fluctuations in turn could induce electric fluctuations at ground level that then blow out electrical transformers in power grids. The CME's particles, she says, also collide with crucial electronics onboard a satellite and disrupt those systems. Not only will such a development impact critical civilian infrastructure, but it could have an adverse effect on U.S. military systems because of their heavy reliance on commercial satellites for worldwide communications. The effects from even a solar EMP are seen not just as a possibility but an inevitability. "In an increasingly technological world," Fox said, "where almost everyone relies on cell phones and GPS controls not just your in-car map system but also airplane navigation and the extremely accurate clocks that govern financial transactions, space weather is a serious matter." Such an attack would come like a bolt of lightning. "We know it is coming but we don't know how bad it is going to be" acknowledges Richard Fisher, director of NASA's Heliophysics division. A storm maximum today could result in large-scale blackouts affecting more than 130 million people and would expose more than 350 transformers to high-risk or permanent damage. 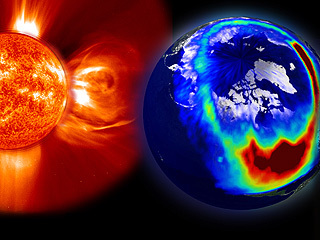 Without taking adequate protective measures between now and the time of the expected "severe geomagnetic storm scenario," experts agree the cost from space weather-induced outages that in turn could cause "non-space-weather-related events" could run from $1 trillion to $2 trillion during the first year alone, with a recovery time taking anywhere from four to 10 years.